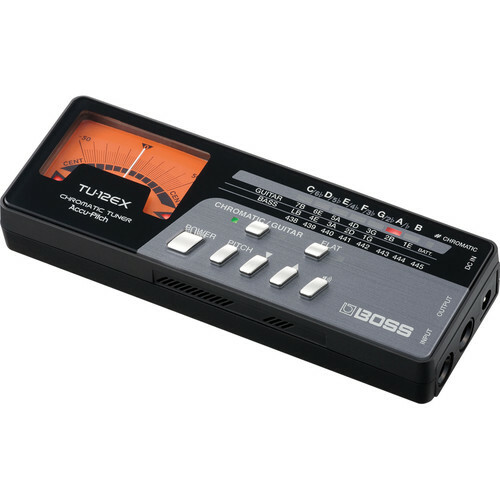 The TU-12EX Chromatic Tuner from BOSS is a metered, needle-accurate tuner with Accu-Pitch that features an audible verification for tuning acoustic, electric, and bass guitars. The 1/4" / 6.35mm line input works with electric instruments, while the built-in microphone allows for the tuning of acoustic guitars or other instruments not equipped with a pickup. The TU-12EXs metering has sharp and flat indicators to ensure perfect tuning. The unit supports drop tuning and features a special flat mode which lowers the pitch in user defined semitone increments. The Auto-Off function prolongs battery life and turns the unit off when inactive. The TU-12EX ships with two AAA batteries. Box Dimensions (LxWxH) 6.693 x 3.307 x 1.732"